I just wanted to set up a static IP address for a fedora 19 machine in my LAN. 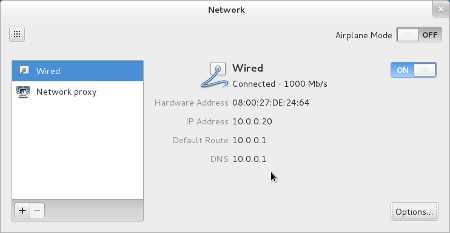 I'm used to /etc/network/interfaces from debian but that file doesn't exist here. After googling around a little bit, I found a small tutorial that tells one to disable NetworkManager via systemctl and enable network. After that one could configure the static IP address in a file called /etc/sysconfig/network-scripts/ifcfg-*interfacename*. Here is my first problem: I found a file with the MAC address of my interface as displayed by ifconfig but the name after ifcfg- doesn't match the name from ifconfig. Why is that like this? My second problem is about using NetworkManager.service or network.service. I read in a Forum, that network.service is still included for compatibility reasons and may be excluded soon. If network.service will soon be replaced by NetworkManager.service, shouldn't I choose NetworkManager.service to configure my network interfaces? If yes, how do I do that with NetworkManager from a shell? Make sure NetworkManager.service is still enabled, and network.service is disabled. The most IMPORTANT step is to delete the current ifcfg-enp2s5 script. Set the contents of ifcfg-p3p1 to the following, and update the respective IP settings with your desired settings. As for why the ifcfg-* name was different from the actual device name. I don't know but suspect it has something to do with how the Network settings were applied during installation. 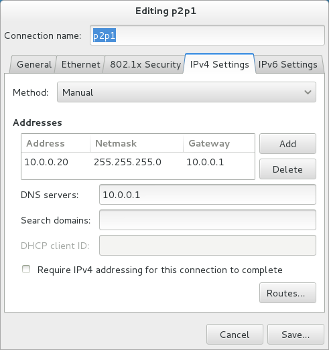 Click on the IPv4 Settings* or IPv6 Settings tab depending on what IP version your home network is using (most likely IPv4). Click on the Method combo-box and select the Manual option. Type the address you want in the Address columns (e.g. 10.0.0.20). Type the netmask for your network in the Netmask column (e.g. 255.255.255.0). When you return to the Network settings, turn the Wired interface OFF. It should automatically turn back on with the static address information you entered in the previous steps. If it does not turn on, click the toggle switch to turn it on. To answer your question about using the NetworkManager.service over network.service. There is definitely potential it could be removed in later releases. As a general rule of thumb though, no matter the topic is, you should always try to avoid using anything "included for backwards compatibility". So, you should stick to using NetworkManager if you can. Setting up the IP there should work. Not the answer you're looking for? Browse other questions tagged linux networking networkmanager fedora-19 or ask your own question. USB Wireless Adapter (Belkin F7D4101) in Slackware?